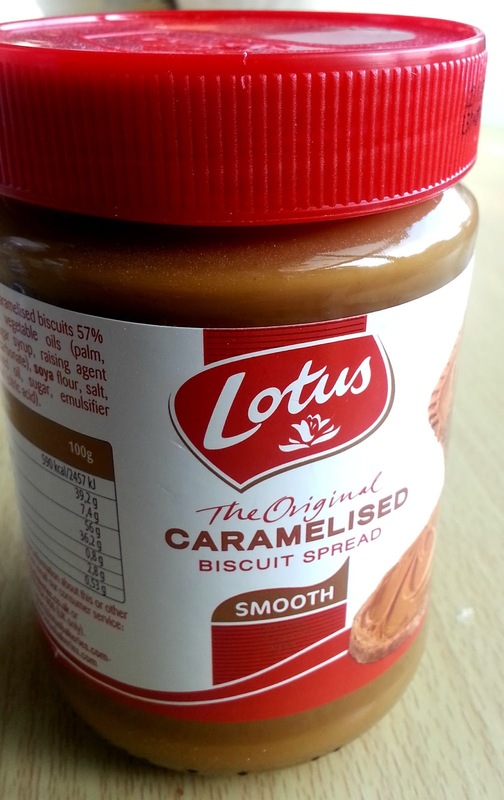 Have you tried Biscoff spread yet? My twitter feed literally imploded last year when the famous speculoos cookie spread went on sale in supermarkets throughout the UK and I've been keen to try out a recipe using the jar I bought on a sweet filled shopping trip a few months ago. I finally decided to try and keep it simple and make a biscoff buttercream so I could try it in a fairly easy recipe to start with - and I wasn't disappointed! Adding it to buttercream means you get the full biscoff flavour and whilst I expected it to be too sweet, it was just right. Myself and the other members of the Cake Eaters Anonymous hive mind were enjoying our semi annual dinner party gathering where we each bring a course and it was my turn to do dessert. 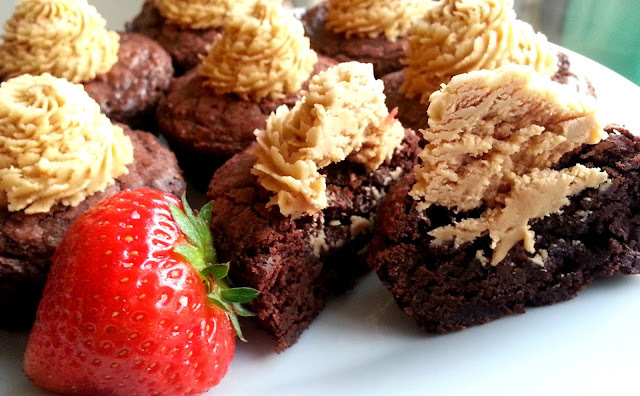 I decided on brownie cups filled with the biscoff buttercream for a handy dessert option and my workload on the day meant I had to scuttle off early but the handy brownie bites meant it was easy enough for me to grab one on the go. I used a boxed brownie mix for these cups as my chocolate supply was depleted after a mammoth ganache making session but next time I'd use my go to brownie recipe. The buttercream was a standard recipe with added biscoff for flavour - I did have to add more Biscoff than I thought and next time I'd add a few drops of milk as the frosting did dry out a little whilst I was piping it. 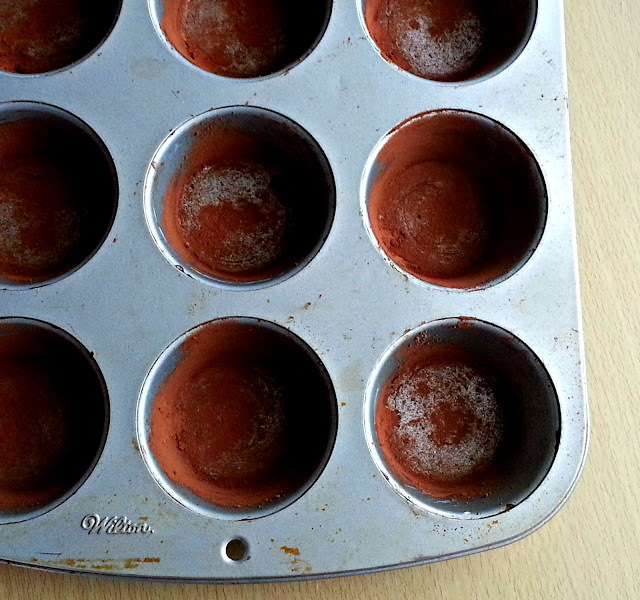 To make brownie cups I greased my usual muffin tin and added cocoa powder instead of flour to prevent the brownies sticking to the tin. I then used a heaped ice cream scoop of brownie batter and cooked the brownies for about 20mins testing with a toothpick half way through baking. Let the brownies cool before piping on your biscoff buttercream although I was tempted to pipe onto the warm brownies to see if the buttercream would melt into the cracks of the brownie. Yummmm. 1-2 tablespoons of milk - I'd add this next time to prevent the buttercream being too stiff and cracking around the edges as you pipe. Place butter and biscoff spread into bowl of stand or electric mixer. Slowly add icing sugar and salt until fully incorporated and mix until creamy. 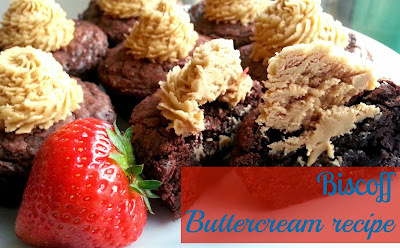 Add milk as needed to loosen buttercream. Pipe buttercream swirls onto brownies or indent brownies slightly and pipe into centre of brownie cups. Yum! 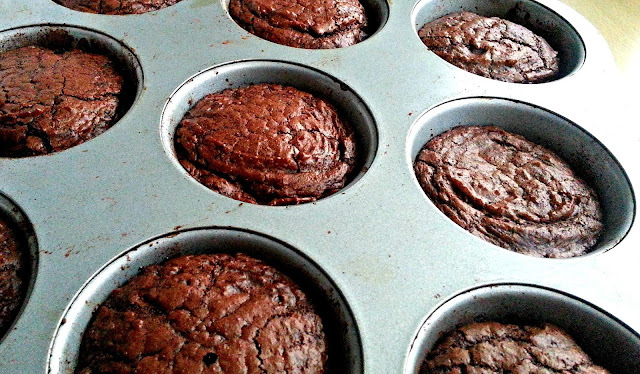 The brownie cups look so delicious!! 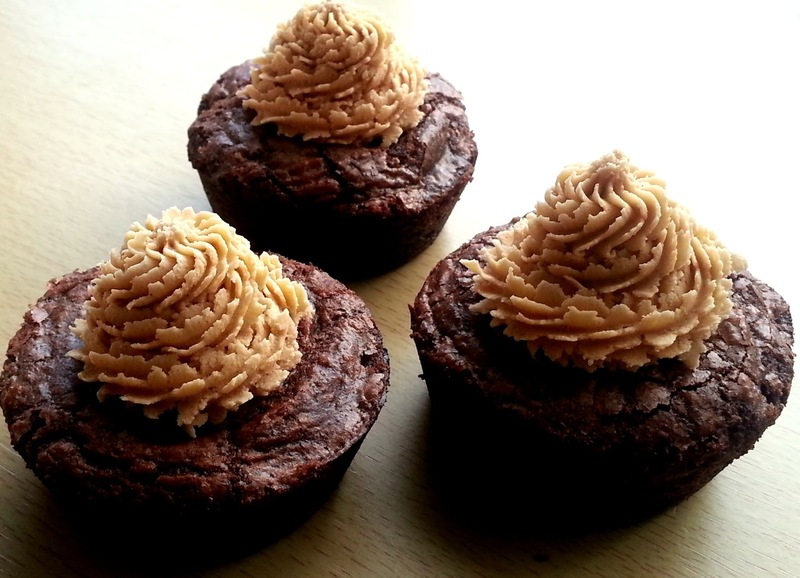 Thanks Kerry, they're pretty tasty and super quick to make!